Alaska Quarterly Review is one of America’s premier literary magazines and a source of powerful, new voices. Alaska Quarterly Review is published by the University of Alaska Anchorage in partnership with the Center for the Narrative and Lyric Arts. 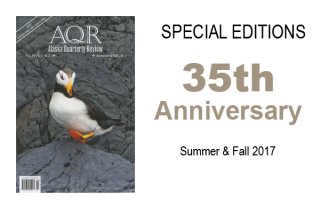 Make a donation to Alaska Quarterly Review. 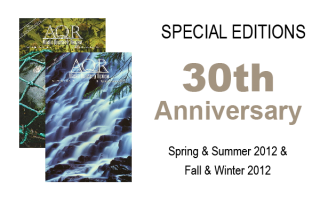 Your donation will help AQR reach future milestones. Your donation will be receipted by the University of Alaska Foundation and is tax deductible to the extent allowed by law. If you mail your donation, please include a cover note that indicates your donation is for Alaska Quarterly Review, and also make a notation in the subject line on the check: “AQR donation.” Your donation will be deposited in the Alaska Quarterly Review account in the University of Alaska Foundation and your donation will be receipted by the University of Alaska Foundation. Buy Alaska Quarterly Review at your local bookstore. If they do not carry AQR, please request that they do so! Ask your local library to subscribe to Alaska Quarterly Review. We often consider complementary subscriptions to public libraries on the basis of need. Recommend AQR to all of your acquaintances and buy gift subscriptions for all your friends and family who love literature.